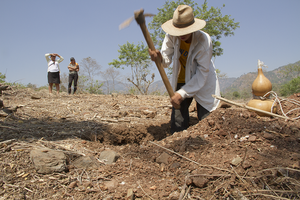 The UN Food and Agriculture Organization (FAO) and the World Food Programme (WFP) are concerned by the fact that the months of June and July saw “lower-than-average rainfall” and “drier-than-average conditions”, which affected the first and principal crop cycle in Central America, known as the primera. Maize and beans, main food staples in the region, have been the crops most-affected by the drought, according to the governments of Guatemala, El Salvador and Honduras, which reported losses of 281,000 hectares of these crops, on which the food and nutrition security of much of their populations depend. These losses will increase the cost of these foods for the entire population. The UN agencies warn that this may be compounded by the possible arrival of an El Niño by the end of the year, which could worsen the already “precarious” food and nutrition security situation of vulnerable rural communities in the region. The second crop cycle – known as the postrera – which usually makes up for the deficiencies of the first harvest, takes place in November, but the UN agencies warned that “even if El Niño turns out to be a weak one, it will have a significant impact on the outcome of the second harvest”. To mitigate the risks this year, FAO and WFP, in close collaboration with governments and partners, plan to closely monitor the impact of the drought on the price of staple foods; develop analysis on the food and nutritional security of the most vulnerable; work on agreements to allow the regulated, safe and orderly temporary migration of people from the rural communities most affected by the drought; and mobilize resources to scale rainwater harvesting and storage systems and reduce the impact of future droughts.